Anglesey County Councillor and Holyhead Town Councillor Jeff Evans completed an epic cycling marathon for four cancer charities: Prostate Cymru, Breast Cancer Care Cymru, Alaw Ward (Ysbyty Gwynedd) and a testicular cancer charity. Inspired to help friends and family who have been affected by a range of cancers, Jeff cycled 1300 miles from the Holy Island (Holyhead, North Wales) to the Holy City (Vatican City, Italy). Member of parliament for Ynys Mon Albert Owen joined well wishers to see Jeff, accompanied by back up vehicle driver Ronnie Williams, begin his challenge on 6th January. The epic event involved cycling through Wales, Ireland, France and Italy. Jeff battled inclement wintery weather including drops in temperature to minus seven degrees! The route consisted of a mixture of secondary roads where Jeff often had to tackle tough terrain and dedicated cycle paths including the Capo Nero Tunnel, which forms an integral part of the annual Milan-San Remo International Cycling Race. 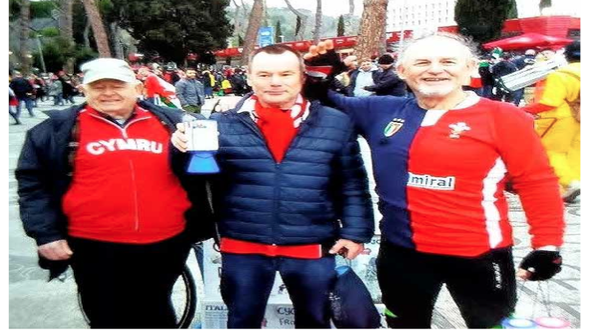 Italian and Welsh rugby fans welcomed Jeff as he reached the Stadio Olimpico in early February in time for the Six Nations match. The Italian Rugby Federation kindly allowed Jeff and Ronnie to attend the game and receive a signed rugby ball to assist with their fundraising. The Rugby Federation also gave Jeff, Ronnie and Councillor Dafydd Rhys Thomas, who had greeted the duo in Rome, the opportunity to encircle the pitch ahead of the match. Shortly after, Jeff visited Vatican City where he received a blessing from the Pope at St Peter’s Basilica. Pope Francis, the 266th leader of the Catholic Church, blessed selected items including rosary beads and crosses with prayers for the sick and their families. Jeff has now passed on these blessed items to patients in Holyhead and Anglesey. Following his return to Wales, Jeff was invited by the Welsh Rugby Union to meet the captain Alun Wyn Jones and the senior Welsh team ahead of the Wales vs Ireland game at the Principality Stadium on 10th March. The team presented Jeff with a rugby ball which he will raffle at his final fundraising evening on Saturday 15th April at The Railway Club in Holyhead. Jeff is hoping the evening will help him reach his target of raising £10,000 for the four charities, having raised over £8000 through the challenge so far. Donations are still being accepted into the dedicated Holy Island/City bank account that the organisers set up for the ride. If you wish to donate please note that the sort code is 53-50-53 and the account number is 57099316. Pictured: Ronnie Williams, Cllr Dafydd Rhys Thomas and Jeff Evans in Rome.